The Director General (DG) of the Ministry of Agriculture, Livestock, Forestry, Fisheries and Biosecurity (MALFFB), Moses Amos, has stressed the importance of working in partnership with the private sector to all Government departments. “You are all serving the same people. 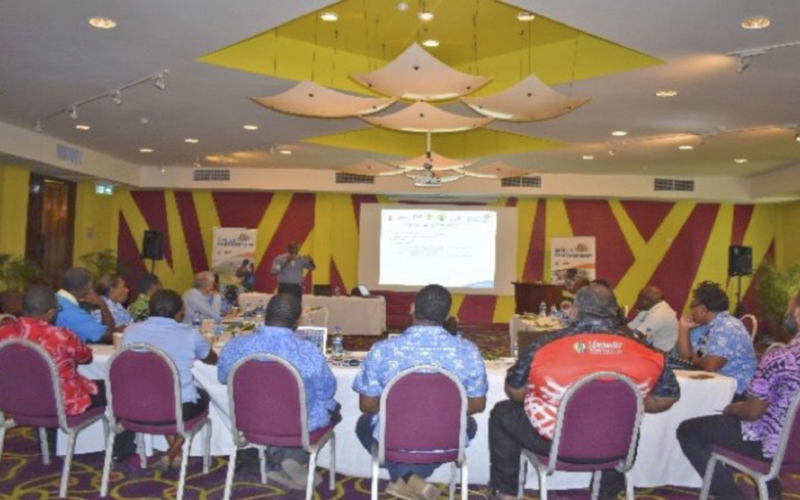 The same person who has a tourism bungalow, also cultivates land to plant root crops, has livestock and go fishing to catch fish for his visitors,” DG Amos said during his official speech at the opening of Vanuatu Skills Partnership (VSP) productive sector partners directors’ meeting at Holiday Inn, Port Vila, on Thursday 14th March 2019. The meeting was attended by directors from government departments and aid agencies that have been working in partnership with VSP over the years. Directors from the Department of Tourism, Industry, Vanuatu Tourism Office, Department of Agriculture, managers, a representative from New Zealand High Commission and a representative from the Australian High Commission were present. “This indicates that the government structure and its services, is resilient through different agencies. “The Department of Agriculture assists with planting resilient crops, the Department of Livestock identifies livestock animals, the Department of Tourism looks at the agriculture products and the sea with its resources that Fisheries Department assists to manage them and key areas to improve bungalows,” said DG Amos. The MALFFB DG said when the value chain with hygiene issues is considered, that is where the Industry Department comes in. DG Amos appealed to the directors at the meeting not to work in isolation. “Partnership is very important, not only within the government but also private sector. “The government’s role is to make policies and regulate them, private sectors provide funds to implement activities, so our partnership with private sector is always very important. He added, “we only have one objective and this is to see how the lives of people struggling daily in the communities would change. DG Amos said challenges faced should not be barriers but provide opportunities to work together to find innovative and creative ideas to drive the productive sectors and other sectors of Vanuatu forward. “I encourage us all not to just talk but to show in our actions that we can work collaboratively. “We are here to find common ways to work together. Public, Private Partnerships is the only way to drive our economy forward,” DG Amos concluded.